This is post number 22 in the series “30 Days of Tales from the Loop,” a celebration of the game set in an 80s that never was. Here are six pre-generated characters you can download, print out, and use in your game if you don’t want to take the time to make characters. These are the ones that my group came up with in our first game. I left the relationships between kids blank, figuring those are the most likely to be in flux and depend on the other party members. 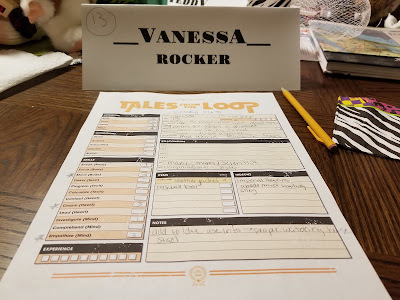 The downloads here use Matt Stark's form-fillable character sheet, from his own excellent overview of Kid creation in Tales from the Loop.